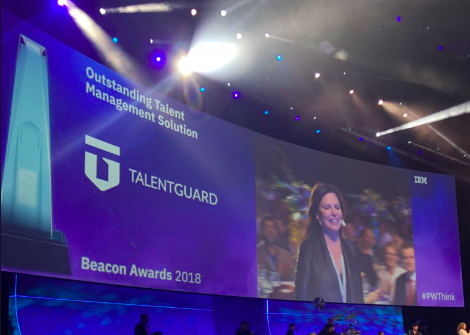 The award recognizes TalentGuard’s exceptional work in driving business value by delivering world-class solutions through its talent management software suite. 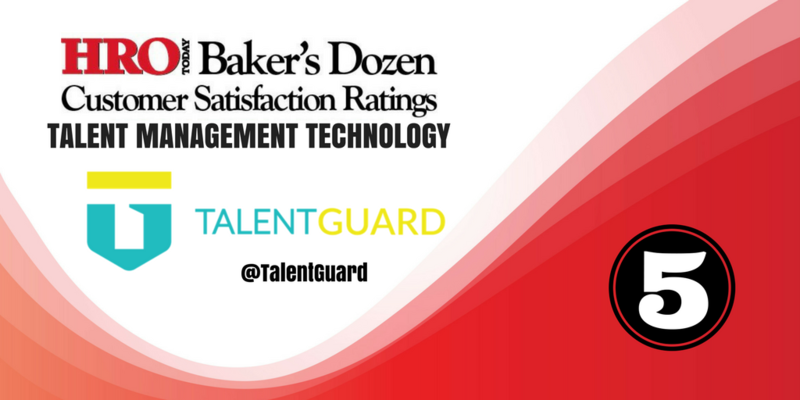 TalentGuard is ranked as a top talent management provider in HRO Today’s Talent Management Technology Baker’s Dozen based on customer satisfaction ratings. TalentGuard CEO, Linda Ginac is an HR Tech Woman listed in RecruitingDaily’s 300+ Women In HR Technology Worth Watching. Read the article here. TalentGuard CEO, Linda Ginac featured as first CEO in WISP's series "Women Leaders Speak." TalentGuard CEO, Linda Ginac is the first CEO in the new series, “Women Leaders Speak”, in which the most influential women in HR tech will tell us about their roads to success and share their visions, fears and perspectives. Read full interview here. Women still only account for a small percentage of CEOs and founders in HR tech companies. 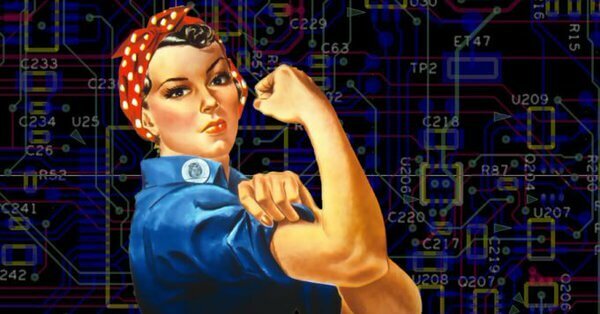 It is significant, though, that many women sitting at the top of these companies have built great products and services and have grown their respective startups into groundbreaking HR technology companies. See the full list here. SHRM interviews TalentGuard CEO, Linda Ginac to learn how Career Pathing reduces turnover. 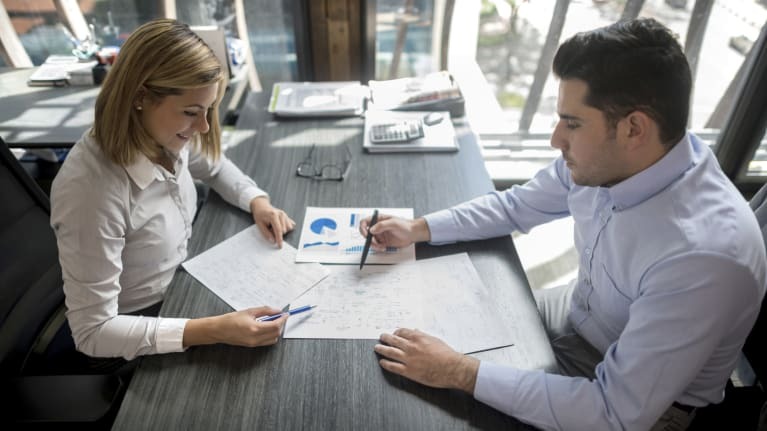 Help Employees Move Up in Their Careers to Drive Down Turnover, written by Rob Mauer, describes how Career Pathing by TalentGuard is helping companies reduce employee turnover. Read full article here. 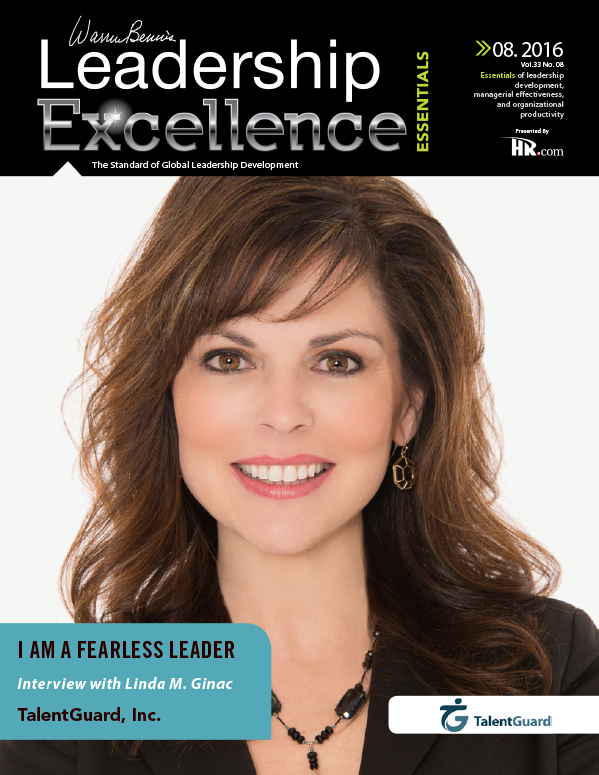 TalentGuard CEO, Linda Ginac is featured in Leadership Excellence with an interview from the LEAD2016 awards. Read her full interview here. 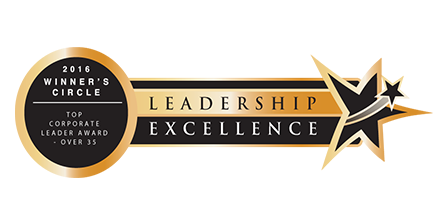 TalentGuard CEO, Linda Ginac was recognized as a Top Corporate Leader Award – Over 35 winner by Leadership Excellence at LEAD2016. To see the winner’s circle, read more. InFluential Magazine select TalentGuard CEO, Linda Ginac as Feature Editorial in the January / February 2016 Issue. 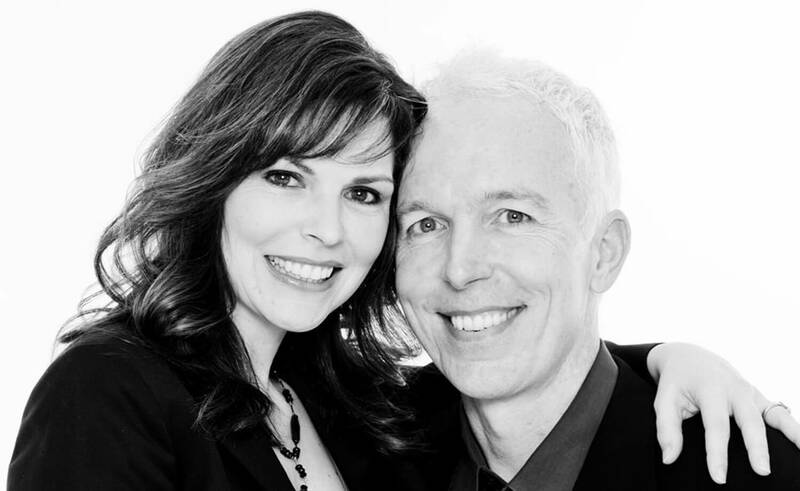 InFluential Magazine are thrilled to have TalentGuard CEO, Linda Ginac as a expert Contributing Writer. 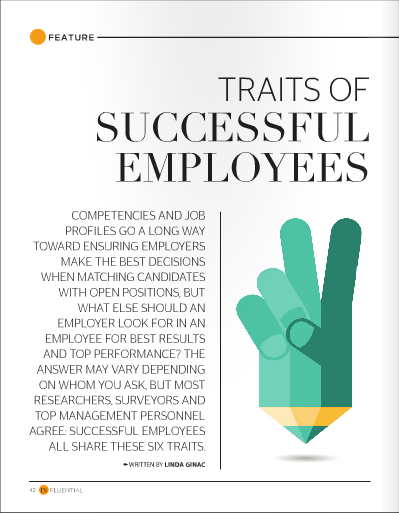 Ms. Ginac’s Feature Editorial in the January / February 2016 Issue titled, Traits of Successful Employees, provides useful information for both employees and employers. 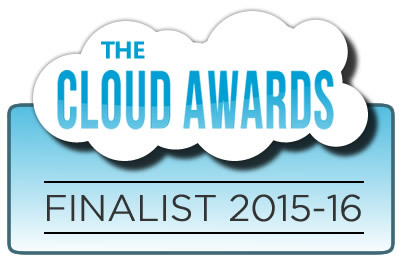 TalentGuard named as Finalist in three separate categories of the 2015-16 Cloud Awards Program. TalentGuard is a finalist of the 2015-2016 Cloud Awards Program in the categories Best HR / Payroll Solution, Best Cloud Automation, and Most Promising Start-Up. TalentGuard was recognized as one of 20 companies that are at the forefront of tackling HR Technology challenges and impacting the marketplace. 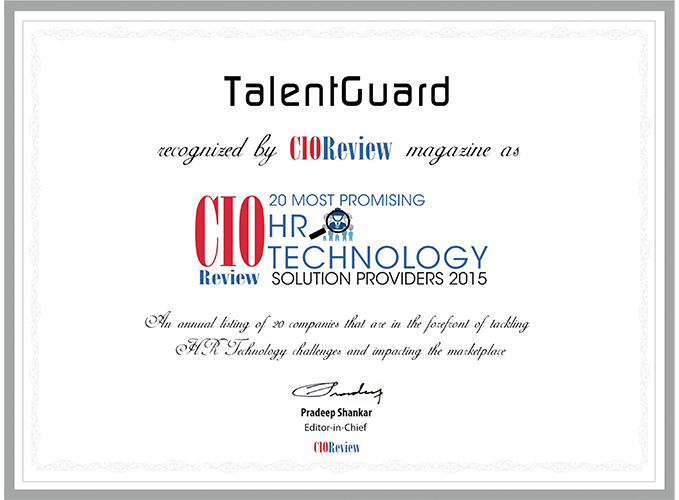 Read more to understand how CIO Review selected TalentGuard as a Top HR Technology Solution Provider. 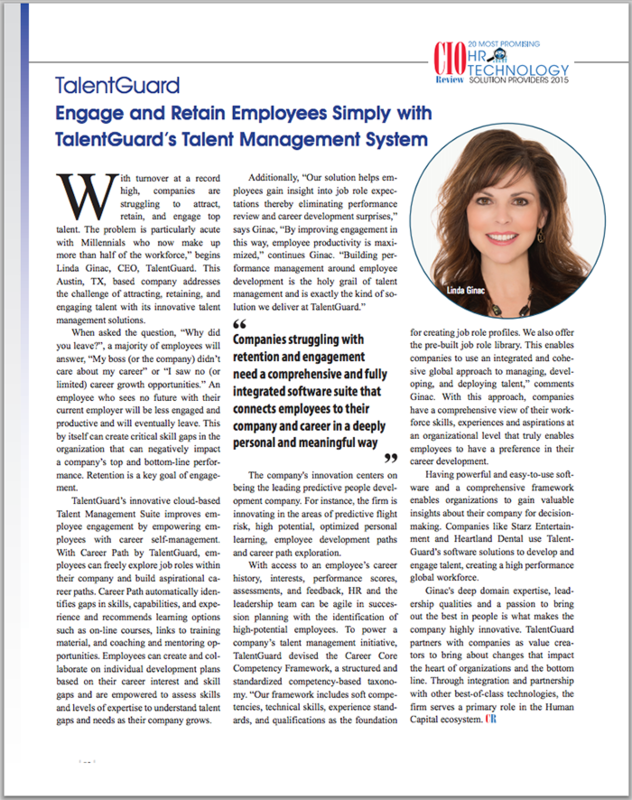 TalentGuard CEO, Linda Ginac explains how TalentGuard’s innovative talent management solutions addresses the challenge of attracting, retaining, and engaging talent. Read more to view the full article. TalentGuard CTO, Frank Ginac shares his first experience migrating a legacy enterprise software application to the cloud in the early days of cloud computing and the near tragic mistakes he and his team made and lessons learned. 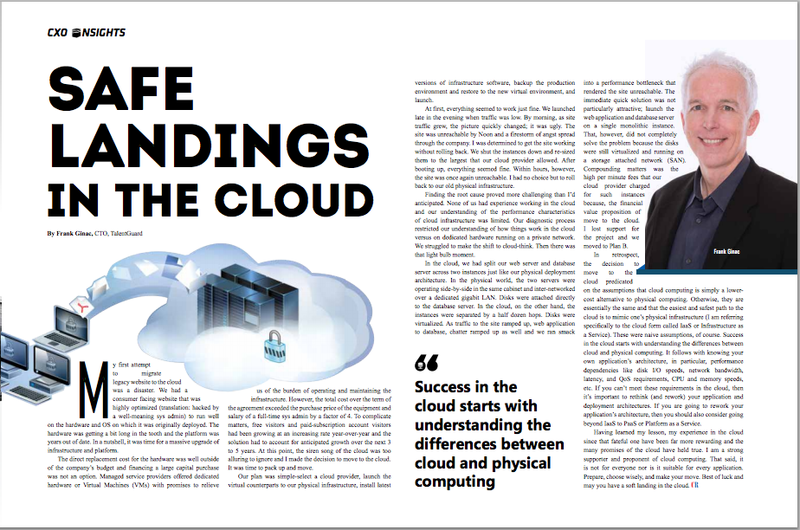 If you’re contemplating a move to the cloud you must read this article. Read more to view the full article on page 43-44.